Adding a barbell to hip thrusts increases the demand on your back. The barbell hip thrust is very similar to the lying bridge exercise, except that it incorporates a weighted barbell and requires you to put your shoulder blades up onto the edge of a flat bench. Because of these two tweaks, hip thrusts are significantly more challenging. Those looking to build strength in their lower back and hips while decreasing back pain would benefit from including barbell hip thrusts into their workouts. As you pick up your hips off the floor, your lower back extends. The erector spinae muscle, which runs along your spine from your pelvis up to your neck, is responsible for extending your back and is thus the primary muscle involved in the movement. During daily activities, for example, when you’re sitting or standing, your erector spinae muscle contracts to hold your torso in an upright position. Exercises that require your back to extend throughout its complete range of motion have been shown to decrease discomfort and pain in the lower back, according to ExRx.net. People who sit for long periods of the day will find that their hamstrings tighten and their erector spinae muscles become fatigued, which can cause lower back pain. Strengthening the erector spinae muscle so that it can work for longer periods before exhaustion can help reduce the risk of discomfort. Your erector spinae muscle handles most of the work during the barbell hip thrust, but because it's a compound exercise that requires movement at your spine, hips and knees, your gluteus maximus and quadriceps also contribute. The gluteus maximus, which is the largest muscle in your buttocks, helps by extending your hips as you pick them up off the floor. The quadriceps, which consist of four muscles at the front of your upper thighs, extend your knee joints. By regularly incorporating hip thrusts into your workout regimen, you’ll see strength increases in both the gluteus maximus and quadriceps. The barbell hip thrust can be tweaked to increase or decrease the difficulty of the exercise. Beginners can perform the exercise without holding a barbell on top of the hips by just using their own bodyweight as resistance. As you build strength, weight can be added to the barbell to increase the challenge. In addition, instead of keeping your feet on the floor, you can further increase the demand on your lower back, gluteus maximus and quadriceps by putting your feet up on an elevated surface. 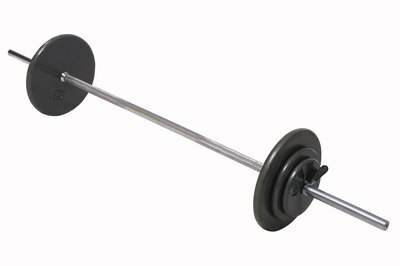 Are Lower Back Extension Machines Good or Bad? What Muscles are Worked by the Incline Leg Press? What Are the Benefits of Barbell Rows? 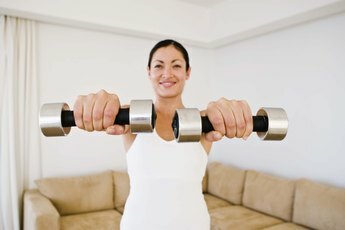 What Do Front Raises Work Out?